Made to order. Usually dispatched within 7 working days. These wonderful Kilner style dog treat jars are personalised with a ceramic photo tag of your dog and filled to the brim with treats and a toy. They are the perfect gift for all good little (and big) dogs everywhere. Quality glass jar with Kilner style clip top. 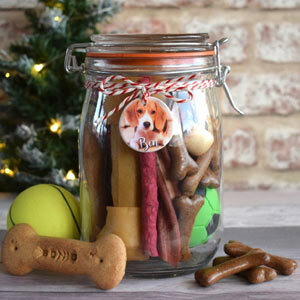 The jars are completely air tight to keep the treats nice and fresh. Once your dog has devoured all of the treats simply re-fill and re-use. Woof! Makes a great gift or vintage statement in your kitchen and each one is personalised especially for the lucky doggie recipient. Tied with red and white twine holding the circular tag that is personalised with your dog's name and photo. Your dog's photo is reproduced onto the ceramic tag and then a clear coating is applied for protection. 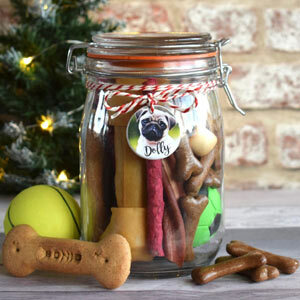 Each jar comes filled full of various dog treats such as rawhide bones, teeth treats, Smackeroos, Yappies Chews, Twizlers and gravy bones. There is also a toy for your pooch. 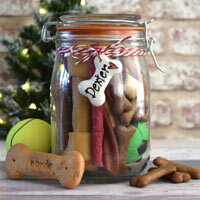 The perfect gift for your dog or a dog loving friend. Contents may vary from examples given and images shown.